To prepare its students for the explosive growth of digital media, Louisiana State University (LSU) constructed a three-story, $29.3 million Digital Media Center (DMC). Arthur Cooper, executive director of the Louisiana Emerging Technology Center, guided the DMC project, which was designed by Coleman Partners Architects of Baton Rouge, LA. To prepare its students for the explosive growth of digital media, Louisiana State University (LSU) constructed a three-story, $29.3 million Digital Media Center (DMC). Arthur Cooper, executive director of the Louisiana Emerging Technology Center, guided the DMC project, which was designed by Coleman Partners Architects of Baton Rouge, LA.AV systems were designed and specified by Bill Schuermann, senior consultant of Houston, TX-based HFP Acoustical Consultants, with acoustical design by Aston Taylor of HFP. The design objective was to give DMC users the utmost flexibility for everything from film showings and interactive digital media presentations, to experimental music concerts and intimate meetings. Enabling this flexibility is a Meyer Sound cinema system and Constellation acoustic system installed by Miami, FL-based Pro Sound and Video. The tech-laden 200-seat auditorium at DMC is the world’s first venue to offer a full SMPTE-standard, 7.1-surround Meyer Sound cinema system along with a Constellation system. The combination of the two, coupled with 4K digital projection by Christie, provides a vehicle to enhance Louisiana’s digital media industry and promote collaboration among its users, who include students, researchers, and corporate partners such as EA Sports. 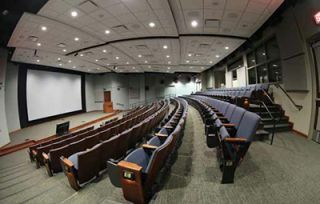 The 200-seat auditorium at the Louisiana Digital Media Center is the world’s first venue to offer a full SMPTE-standard, 7.1-surround Meyer Sound cinema system along with a Constellation system. DMC is the university’s second room with a Constellation system; the first system was installed in the 1,100-seat Union Theater in 2011. At the press of a button, Constellation can transform a room from a concert space to a screening room. The system in DMC also includes the voice-lift feature, which allows the auditorium to double as an intimate meeting space where both presenters and audience members can be heard easily, with no need for microphones or raised voices. Using the patented VRAS algorithm, a D-Mitri digital audio platform is at the heart of the Constellation system. The system also includes 24 microphones, as well as 12 Stella-8C and 26 Stella-4C installation loudspeakers, 16 UP -4XP 48 V loudspeakers, and eight MM-10XP 48 V subwoofers. Ten UP J-1P VariO loudspeakers and eight HMS-10 cinema surround loudspeakers are used for both Constellation and the Meyer Sound cinema system, providing surround sound for the latter. Identical to what is found in many high-end cinemas and Hollywood screening rooms, the room’s Meyer Sound cinema system comprises one Acheron 100 and two Acheron 80 screen channel loudspeakers, as well as six X-800C cinema subwoofers. As both Constellation and the cinema system are connected to the D-Mitri platform, the two systems can be fully integrated to create custom immersive audio effects. In addition to the auditorium systems, 106 more Meyer Sound loudspeakers are installed in other locations throughout the DMC, including Stella-8C loudspeakers, UP J-1P loudspeakers, and HD-1 studio monitors.